A cute and seemingly happy teenager with a sad family life that he hides behind his cheery demeanor. His endless whining and crying often annoys Kyo. He is older than he looks, much to Tooru's surprise, he is only 1 year younger than Yuki, and Kyo, the same age as Hatsuharu. 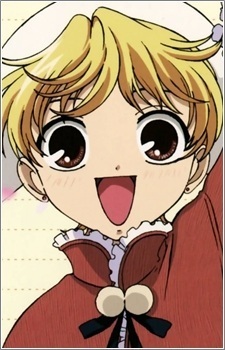 Momiji is the rabbit of the Zodiac and is the son of one of the richer members of the Sohma family. His father is Japanese while Momiji's mother is German. Momiji has also a younger sister, Momo. Momo is unaware of the fact that she has an older brother. Her mom's memory of Momiji was erased because otherwise she might've slipped into utter madness. Momiji is actually very insightful and emotionally strong despite his upbringing. He warmed up to Tooru very quickly, even ignoring the fact that he was a Zodiac and hugged her when they were formally introduced. Much to Kyo's horror, Momiji likes to wear the girl's version of their high school uniform, albeit with short shorts and not a skirt. Momiji sometimes sees Tooru at work and helps her clean. He even did Tooru's share once when she was sick with a cold. Momiji also develops feelings for Tooru. He tends to cross dress a lot.